So far, there’s been no outstanding title for either the new PS4 or the Xbox One. Until now. 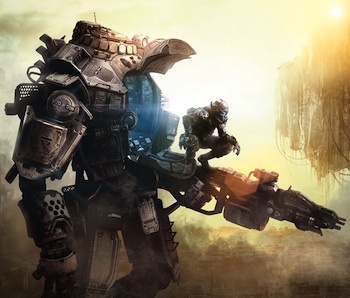 Shooter, Titanfall, for Xbox One (also on Xbox 360, Microsoft PC) is the year’s first must-have title, and gamers have been itching for it. Created by the team that introduced the blockbuster Call of Duty franchise, Titanfall is a frenetic, multiplayer first-person shooter set in a near-future, war-torn environment. What sets the game apart from other shooters is that the player not only commands heavily-armed foot soldiers, but can also jump into the cockpit of giant, heavy-duty weaponized robots called Titans. Moreover, soldiers, known as Pilots, have the ability to athletically run along walls and bound huge distances with the assist of a jet boost. Switching between the lumbering, solider-stomping Titans and nimble Pilots adds a layer of fun and tactical challenge to the genre. But like the Call of Duty titles, Titanfall is a sometimes violent, ‘M’ rated experience. Soldiers are blown to bits, shot in the head and crushed. Also, only multiplayer mode is available. There’s simply no playing solo – gamers must go online and interact with others. While this makes for frenzied combat, it also exposes players to the verbal whims of other players – meaning plenty of profanity. For older teens and grownups who love the shooter genre, the game is a slam dunk. But for younger players, there’s no way to play without exposure to lots of killing and raw language.